Looking for a bus in Rosemont? Chicago Charter Bus Company has access to hundreds of buses to take you to iFly Indoor Skydiving, the Donald E. Stephens Convention Center, and more. What could be better than your location in Rosemont? Just five minutes from O’Hare Airport and a short 20-minute drive from downtown Chicago, Rosemont is in the ideal spot. Rosemont residents have everything at their fingertips, so the concept of convenience is no stranger to you. If you could crank up the convenience factor even more in your life, would you? The buses we charter are fantastic solutions for a variety of needs—keep reading to see how we can help Rosemont residents like you travel with ease. Birthdays spent at Wrigley Field, rehearsal dinners cruising the Chicago River, and road trips across the state for sports tournaments can all be made much more memorable when you choose to arrive in a private motor coach. Best-in-class and unwavering in reliability, the minibuses and coaches we charter take away the stress of driving. Thanks to your personal chauffeur, you can get to and from celebratory life events safely without needing to worry about how much champagne you consume. Imagine the ease of private, personalized wedding shuttles that scoop up out-of-town guests at their hotels and bring them to the ceremony; or pregaming your favorite concert or sports game with all your friends in one fun vehicle. Living in Rosemont is even better with the addition of Chicago Charter Bus Company—check out more information on the types of events we work with. Hosting an event in another neighborhood of Chicago? We also service Highland Park, Naperville, Oak Park, Winnetka, and more of the surrounding areas. With us, the travel possibilities are endless. No matter how many people you plan on piling into your bus rental, you should have no problem finding a vehicle with plenty of space. The 56-passenger charter buses are the largest in the fleet and feature lots of storage space, which is ideal for large sports teams traveling to championships or school field trips out-of-state. Add reclining seats and TV monitors to the mix, and not only are the students comfortable during the long ride, but they’re entertained, too! These add-on features plus many more upgrades are available on any bus or minibus size. The minibuses we charter range from 18-passenger capacity to 25-passenger, and these small to medium shuttles are often perfectly sized for wedding transportation, church outings, and personal events. Let’s get you on the road, Rosemont! 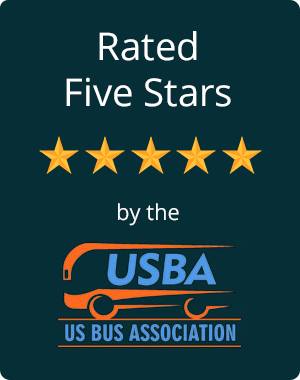 If you have any questions about the buses we charter, the available amenities, or the various trip options you can orchestrate with a private driver, just give us a call. Our booking specialists are available 24 hours a day, 7 days a week to answer your questions and get you booked within minutes. Call us today at 312-667-0906 for your fast bus rental quote in Rosemont.